Games Played, 21. Won 12. Lost 4. Drew 5. * East Melbourne disbanded in August. If anyone has the the Goals For/Against details, please contact Blueseum. 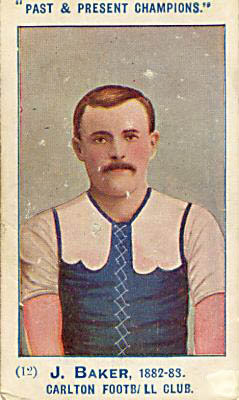 William "Billy" Goer 1882 Carlton captain. 1882 Carlton teams and results as published in newspapers. Some match/result details are missing, if anyone can provide them please contact Blueseum. Carlton F. C. AGM held at the Clyde Hotel, Carlton 8pm. Mr. R. Robertson, president of the club in the chair. Patrons, Messrs. Gardiner MLA, Latham, Pigdon, Bell. President, Mr. R. Robertson; Vice presidents, Messrs. Gillespie, Power, Donovan, and V. Robertson. Committee, Messrs. Brooks, Murphy, Robertson, Conway, Gardiner, A. Wilson, McHarg, and Turnbull. Hon. secretary and treasurer, Mr. M. B. Hearne. The club's finances are in a healthy condition. E. Fitzgerald and Lampard from the Waverley Club. Whelan, A good follower from Star of Carlton. Tully and O'Loghlen, from South Carlton. Nash a heavy weight follower from Star of Carlton. P. Lacey, The crack of the Waverley Club. The Australasian reports of a recent meeting held between the Richmond Alma and the South Richmond clubs with the aim of forming a club to represent the city. It was agreed that the two clubs would merge into one and be called the Richmond Football Club. Assistant Secretary for Carlton F. C. £1 ($2) per week. This position was taken by Mr. J. S. Spear. Mr. F. Conway, became the caretaker and property master. Practice match on Prince's Oval 3pm. Teams to be selected by the captain and vice captain. The Argus wrote about the inequities in the V.F.A. programme of matches. President vs Vice President practice game on Princes Oval. "I learn that Baker of the North Geelong Club, is in Melbourne and will appear in the battle-field on behalf of Carlton next Saturday against the Star of Carlton. Baler has not yet signified his intention of staying in Melbourne, but, should he do so, he will be a great acquisition to the dark-blue." The South Australian Register reports that the Carlton Football Club had donated £7 10s ($15.00) to the Lady Ayers Homes, twenty-five two houses in Adelaide. The Australasian reports that this season Carlton will lose the services of George Robertson and possibly Brooks/Brookes. Tom Bushell from South Melbourne. Joseph 'Joey' Tankard from Hotham United. Michael Nash A heavy weight follower from, the Star of Carlton. Barney Murphy has returned and may play. Jack Baker ex North Geelong. Wilson, Bailey and O'Neil were absent. Bushel of South Melbourne was selected but declined to play. The match was played in drizzling rain and showers. A rather monotonous game which was enlived after the break with a few goals. Bailey, Boyd (ex Hotham), Bushel, Baker, Bloomfield, A. Coventry, Coulthard (Vice Capt. ), Conway, Frayne, Goer (Capt. ), Lacey, Maloney, McIntosh, O'Donnell, O'Neil, John Rickards, James Rickards, F. Spear, Smith, Tankard. Best; Maloney, Frayne, Conway, Coulthard, McIntosh, W. Goer. New recruits Baker ex Geelong, Bloomfield (BOG) and Tankard played well. Carlton Reserves played Carlton Zingari at Royal Park. The contenious issue of inducements or payments to players in a "strictly amatuer" sport is an interesting one. An unnamed northern player was lured to a rival club south of the river, which was possibly South Melbourne. The player was fully determined to get the highest value for his services. The northern club in which he had gained his fame had secured regular employment for him last season. Everthing was fine until recently the rival southern club had offered him employment, a rent free house, and the prospect of match payments. He agreed to the move. However after he had moved camp, the player then decided to have a change of mind and his former team mates helped him move back to the northern suburbs; much to the disgust of his new team mates. "Now, though this case has a decidedly comical side, it also has a decidedly serious one as indicating how far clubs are prepared to go, even to the the length in introducing the thin end of the wedge of professionalism, for the purposes of securing a desirable man; and there is no doubt, if this idea of beggar-your-neighbour goes on much longer, football will soon be confined to two or three clubs whose financial resources enable them to monopolise the best talent; and what is now a merely manly recreation, will speedily become but a money-making game, with all it's attendant evils. I suppose it does not require a very brilliant discernment to trace the present tendancy to the gate-money business, and I think it is about high time the better class of clubs should band themselves together and endeavour to stamp out this semi-professional phase which is coming to the front, or before long we shall see such items as these in the annual balance-sheets, "Fees for professionals, first 20 so much; special services for A and B, so much," which assuredly would bring in the beginning of the end for football as it had been in the past, and as it's truest votaries* wish it may ever remain." Joseph 'Joey' Tankard after having an altercation with George Coulthard left the Blues and was back playing for Hotham against Essendon on the M.C.G. This ill feeling between the two players would explode with dramatic consequences when Carlton met Hotham on August 12. Carlton played Northcote (23) at Princes Oval. A strong wind blew across the ground, restricting good play. Coulthard kicked the only Blues' goal in the first half. Baker, Bailey, Boyd, Bloomfield, Barrass, Coventry, Coulthard, Conway, Frayne, Goer (Capt. ), Lacey, Maloney, McIntosh, O'Loghlen, O'Neil, O'Donnell, John Rickards, Smith, Slattery, Tankard. Goals; Coulthard 2, Conway, John Rickards. Best; (12) Baker (BOG), Coulthard (also a splendid game), Bloomfield, Boyd, Conway, O'Loghlen, Coventry, Frayne, Goer, Maloney, Rickards, Lacey. Cook, Donovan, Gibbins, Goding, Graham, Hassett, Hickford, Leach, McKay, Melvile, J. Muir, W. Muir, Petherick, Samuels, Shearer, Spear, Sutherland, Terry, Wheeler, Woodburn, Woods. Players mentioned; Hassett, Melville, Cook, Graham. The visitors kicked to the eastern goal with the advantage of the wind in the first half. Although Waverley, playing two players short, were overwhelmed by the Blues, a fast and lively game was played. P. Lacey who was reported to have been a new Carlton recruit this year captained the Waverley team in this match. Baker, Boyd, Bloomfield, Barrass, Coventry, Coulthard, Conway, Doran, Frayne, Goer (capt. ), Lacey, Maloney, McIntosh, O'Donnell, O'Neil, O'Loghlen, John Rickards, Smith, Slattery, Wilson. Goals; Coulthard 2, Conway, A. Wilson, Baker. Players mentioned; (12) Coulthard, Coventry, Baker, Frayne, Bloomfield, Goer, Smith, O'Donnell, A. Wilson, Rickards, Conway, McIntosh. Footscray won the toss and kicked with a strong breeze at their backs, the Blues evened up in the second half. No scheduled match for the Blues. Instead Carlton held a practice match at Princes Oval. The Herald Friday May 19 (p4) has the Carlton team playing a team to be advised. Carlton Reserves played Victory at Princes Oval. Anderson, Bradshaw, Cook, Donovan, Ford, Graham, Goding, Hassett, Hickford, Leach, Melville, J. Muir, W. Muir, J. McIntosh, McKay, Riley, Robertson, Shearer, Spear, Sutherland, Samuels, Slattery, Woodburn. May 24 Wednesday Queen's Birthday Holiday. Carlton played the Ballarat Football Club at Saxon paddock in Ballarat. The team left for Ballarat on Tuesday afternoon. The weather was poor in the Golden City. The home team colours were red, white, and blue. The Blues kicked against the wind, and rain set in towards the end of the game. Conway scored the only Carlton goal in the first half. The half time break was 10 minutes. Frayne added the next two goals, followed by one from Coventry. The locals reckoned that this was the finest display of football the city had seen. After the game the teams went to the Kent Hotel opposite the ground for refreshments & toasts from the captains. Bailey, Baker, Barrass, Bloomfield, Boyd, Conway, Coventry, Coulthard (Vice Capt), Doran, Frayne, Goer (Capt), Lacey, Moloney, McIntosh, O'Donnell, O'Neill, O'Loghlen, Jas. Rickards, Smith and Wilson. Goals; Frayne 2, Conway, Coventry. Best; Frayne, Coulthard, Baker, Bloomfield, Conway, Wilson. Players mentioned; (15) Rickards, O'Neil, Doran, McIntosh, Goer, Coventry, O'Donnell, O'Loghlen, Bailey, Conway, Coulthard, Baker, Bloomfield, A. Wilson, Frayne. Carlton Second Twenty played Colac at Colac. The match was played on J. V. Bartlett's paddock fronting Lake Colac and the Blues were entertained at Willis's Commercial Hotel that evening. Anderson, Bradshaw, Cook, Donaldson, Ford, Graham, Henry, Hassett, Leach, Muir, Muir, McKay, McIntosh, McWilliams, R. W. Robertson, J. Robertson, Spear, Samuels, Shearer, Terry, Thornhill, Woodburn, Woods. "Coming, however, to the present match we may say that we were rather disappointed in the visiting team, and this fact is borne out by the result of the match. It was certainly good of a number of strangers to come so far to treat the Colac people to an enjoyable game of football, and although they were not immerically weak they were so physically. Throughout the game Carlton had no show of winning the match, and next season they had better send up their first twenty, instead of their second." A depiction of the Carlton vs South Melbourne, May 27 1882, The Leader, Mark Pennings' Origins of Australian Football Vol 2. Carlton played South Melbourne at the East Melbourne Cricket Ground. A beautiful day and hardly a breeze. Goer won the toss and kicked down the slope towards the railway, play began at about 3.15pm. A very close fought game that was not decided until the final moments when South kicked a couple of goals. Poor kicking for goal was again a problem. The Blues missed a couple of sitters right in front when the ball twice slid from the player's hands just before getting a boot to it. Baker, Barrass, Boyd, Bloomfield, Bailey, Coventry, Coulthard (Vice Capt. ), Conway, Frayne, Goer (Capt. ), Maloney, E. Murphy, McIntosh, O'Neil, O'Donnell, John Rickards, James Rickards, Smith, F. Spear, Wilson. Best; Coulthard, Barrass, Bailey, Bloomfield, Murphy, McIntosh, Wilson. Players mentioned; (18) Goer, Frayne, Conway, Coulthard, Coventry, Maloney, O'Neil, John Rickards, Smith, Bailey, Harry Wilson, Baker, O'Donnell, McIntosh, Spear, Barrass, Bloomfield, Murphy. Half time entertainment was a tug-of-war between two teams from Carlton and Melbourne football clubs. "It is probable that even if the Melbourne and Carlton twenties were to sink to the level of junior teams, their matches would still for the sake of old associations be liberally patronised by the public. Many of the spectators at Saturday's match remembered having watched with even more interest than at the present similarly clad twenties struggling for supremacy in matches in which no single player among the forty who on Saturday carried their club colours took part. Another reason for the good attendance was the fact that however unfortunate either club may have been in matches with other teams besides it's old rival, when coming together each always managed to present it's most formidable front, and consequently the matches always are, probably always will be, fraught with interest." Neither team fielded it's best twenty, Conway and James Rickards did not play. Umpire O'Neill was impartial, but he was far too lenient with infringements of the rules and failed to even pay one free kick! Baker, Bailey, Bloomfield, Barrass, Boyd, Coulthard (Vice Capt. ), Coventry, Conway, Frayne, Goer (Capt. ), Maloney, E. Murphy, McIntosh, O'Neil, O'Donnell, James Rickards, John Rickards, Smith, F. Spear, Wilson. Goals; Baker 3, Rickards, A. Wilson, Coulthard. Players mentioned; (18) John Rickards, Harry Wilson, Baker, Coulthard, Donovan, Maloney, Bailey, Barrass, B.Murphy, O'Donnell, Frayne, Bloomfield, Smith, O'Neil, McIntosh, Goer, Boyd, Coventry. Others (2) E. Murphy and F. Spear, not mentioned, probably played. At the V.F.A. meeting the Hotham delegate Mr. Jordan, proposed dividing the the game into quarters, this would eliminate one team having too much of an advantage with the wind. The proposal was voted on with 7 votes for, and 3 against. Football pioneer H.C.A. Harrison strongly argued against. As an abolute majority is required to alter the laws, this proposal was defeated. The Australasian reporting on the popularity of the game in Western Australia says that the game is still in it's infancy in Perth and loyalities are somewhat divided with the Australian game and Rugby. "As to it's dominion football is played exclusively in Victoria, South Australia, and Tasmania; while in New South Wales, Queensland, and New Zealand it embraces half the playing talent, the other half being addicted to the Rugby game, the association game of Britain being scarcely known, and all the intercolonial matches even that with New South Wales, are played under it. It must further be remembered that there are as many players in Victoria as in all the other colonies together, and that the sport is immensely popular with the public, who flock in crowds of from 10,000-15,000 to see a first-class match; whereas a Rugby Union game in Sydney, the stronghold of that code, a tenth part of that number would be a good gathering. Moreover, from a player's point of view, it is much less intricate, and less dangerous, than the Rugby; and much more interesting owing to the absence of "off" and "on" side, and the multitude of scrimmages that characterise that game. I would certainly say to my West Australian friends - if you want a game that will become popular with the public and players - a game with strong inherent vitality - go for the Victorian one which is the greatest athletic sucess of late years, and put aside any thought of the Rugby code, which is almost stagnant, if not actually losing ground, all over Australia, and which apparantly has had it's day, and soon, from present symptoms, will cease to be south of the line." Carlton played Hotham at the East Melbourne C.G. The Blues won the toss and kicked to the railway end with the aid of a slight breeze. Play got underway just after 3pm. It was soon evident that the game was one sided and the Carlton supporters gave the Hotham blue and whites plenty of advice when the ball was at their end. "Carlton were disciplined, spirited, and safe, making few mistakes, while Hotham, by comparison, played but little together, marked and kicked indifferently, and seemed to have no great relish for the rough and tumble work in which their adversaries were adepts." Baker, Bloomfield, Barrass, Boyd, Bailey, Coventry, Coulthard, Conway, Frayne, Goer (Capt. ), Murphy, Murphy, Maloney, McIntosh, O'Donnell, O'Neil, John Rickards, Smith, F. Spear, Wilson. Best; Goer, Baker, Boyd (wing), Maloney, Rickards, Coulthard, Frayne. Doran, Donovan, Ford, Graham, Goding, Hassett, Leach, Longstaff, Melville, Muir, McWilliams, Robertson, Robertson, Samuels, Spear, Slattery, Sutherland, Walsh, Woodburn, Woods, Wilmott. Carlton played East Melbourne at Princes Oval. Play was delayed till 3.40pm due to the lack of East Melbourne players. Seven subsitutes had to be made and they started the game with 19 men. Carlton had 18 as two of their players failed to arrive. East Melbourne kicked to the cemetery end aided by the wind. A dispute interupted the game for 15 minutes when Tuckfield of East Melbourne's goal was disallowed by the Carlton goal umpire. While the East Melbourne players were disputing the goal umpire's decision, the Blues immediately kicked off and rushed the ball up to the other end and scored a goal by McIntosh. The East Melburnians refused to play until the decision on the first goal was overturned. The game was stopped for a quarter of an hour. Some Carlton players said that the goal should be allowed, however the majority held that it was impossible to overule a decision of the umpire. Baker, Bailey, Boyd, Bloomfield, Barrass, Coulthard, Conway, Coventry, Donovan, Frayne, Goer (Capt. ), Murphy, Murphy, Moloney, McIntosh, O'Neil, Rickards, J.Smith, Spear, Wilson. Best; Baker, A. Wilson, McIntosh, Goer, Coulthard, Frayne. Carlton Reserves played East Melbourne at East Melbourne C.G. In Sydney the discussion is of which is the better game, Australian Football as played by the N.S.W. Football Association, or the Rugby code. The Australian Town & Country Journal has had an on-going debate between two writers calling themselves "Carlton" & "Emu." The issue between them has been ongoing for three weeks, and this week "Carlton" has the final say. The Norwood Football Club arrived from Adelaide on the S.S. Aldinga. They were met by the committees of the Carlton and Melbourne clubs and driven to Garton's Hotel where their healths were proposed by Mr. H.C.A. Harrison. Norwood are the premier club in Adelaide and will play matches against Carlton and Melbourne. After expenses, all takings from these matches will be donated to Melbourne charities. The Herald (p2) reported that the Carlton Football Club donated £16 to the Carlton Mechanics Literary Institute and Free Library. Friday's Herald reports that William Goer has resigned the captaincy of Carlton. The paper said that a new captain will be appointed on the Corio Ground tomorrow. The paper said Frayne, Coulthard and Baker are candidates for the vacancy. Carlton played Geelong at the Corio Cricket Ground. 500 Carlton fans arrived in a special train from Melbourne which departed at 1.10pm and arrived in Geelong at 2.45pm. The match got underway at 3.20pm, with the Blues' John Rickards kicking off to the southern end. A strong breeze was blowing across the ground providing no assistance to either team. Rain during the break and into the second half made the ball heavy and slippery. Umpire Sommers said he could not go on, and to Carlton's doubts for not wanting the match to be drawn, accepted Austin, a former Geelong captain as umpire. "Owing to the state of the weather, darkness was stealing on at about 5 o'clock, when Mr. Sommers, who, up to that time, had acted as central umpire, complained of being "done up," and left the ground without informing either captain of his intention. At that juncture a stranger stepped into the arena and offered his services as umpire. After some time, Austin was sent to fill the vacancy, and when the ball was sent on its way again it could scarcely be seen. Some rough play took place in front of the Carlton goal, when one of the Geelong men got the ball, and deliberately threw it to Curdie, who kicked it to another player. Carlton appealed for a free kick under the circumstances, but although the umpire was fifty yards distance when the ball was thrown, and he could not see it, he disallowed the appeal, and gave a mark to Curdie, who sent the ball through the Carlton posts, amid the wildest expressions of joy from the Geelong supporters. That finished the match, making it a draw in favor of Carlton, the score standing - Carlton, 1 goal and 7 behinds; Geelong, 1 goal and 5 behinds. It seems strange, to say the least of it, that Mr. Sommers, the central umpire, should resign his position at that stage of the game, especially for the reason given - exhaustion, as he is a trained athlete, who plays football, and goes in regularly for rowing, and other exercises." The umpire came in for severe criticism by the Carlton men and their supporters who felt the Blues had been robbed of a victory by a partisan decision by a prominent Geelong clubman. Robertson a first rate back from Hotham United. Baker, Bailey, Boyd, Bloomfield, Barrass, Coulthard, Coventry, Conway, Frayne, Goer (Capt), B. Murphy, E. Murphy, Maloney, McIntosh, O'Neil, John Rickards, J. Robertson, J. Smith, F. Spear, H. Wilson. Emergencies; James Rickards, O'Donnell, Donovan. Best; B. Murphy, Barrass, Goer, Harry Wilson (BOG), Spear, Bloomfield, Frayne. Players mentioned; (19) Rickards, McIntosh, Bailey, Conway, Coulthard, B. Murphy, Goer, Baker, O'Neil, Frayne, Barrass, Maloney, Robertson, Harry Wilson, Smith, Spear, Bloomfield, McIntosh, Coventry. Carlton Reserves played the Brighton Football Club at Brighton. The Horsham Times reported a discussion between the secretary of the Carlton Football Club, M. B. Hearne and the secretary of the Horsham Football Club, Mr. W. J. Uren. It was about members of the first twenty who are not selected in the first team, playing for the second twenty. (1.) The second twenty is considered to be the next best twenty that can be got together in the club after the first twenty has been chosen, irrespective of one or more of them having at any time previously played with the first twenty. (2.) The emergency men chosen for the first twenty are frequently allowed to play with the second twenty if not required to play in the match for which they may have been chosen as such an emergency. (3.) It would, however, be manifestly unfair, in the event of a first twenty having no match on the date on which the second twenty may be playing, to swamp, so to speak, the second twenty with recognised first twenty players, but there can be no question raised regarding the status of either team should both meet engagements on one and same date." Norwood (South Australia) played South Melbourne. "Some decisions of Umpire Barrass, of the Carlton Club, were so grossly unfair to the visitors that the spectators demonstrated their feeling in a manner that could not be mistaken." Tenders invited for the erection of Club Rooms at Prince's Oval. Carlton played the Norwood Football Club at the M.C.G. Gate takings donated to charity. Norwood were fresh from having beaten South Melbourne on Thursday. Waldron won the toss and Norwood kicked with aid of the wind to the railway end. Norwood played well although lacking the dash and precision of the Carlton team. "The quiet and gentlemanly game played by the Carltons was a marked contrast to the rough and unfriendly game played by the South Melbourne team on Thursday." Kinsella was a recruit from North Geelong. Baker, Bailey, Boyd, Bloomfield, Barrass, Coulthard, Coventry, Conway, Frayne, Goer, B. Murphy, Maloney, McIntosh, O'Neill, Jno. Rickards, Jno. Robertson, Smith, F. Spear, Wilson, Snodgrass. Emergencies; O'Donnell, E. Murphy, Jas. Rickards, Donovan. Goals; Coulthard 2, A. Wilson, Rickards or Baker. Players mentioned; (18) Goer, Murphy, Frayne, Coventry, Boyd, Rickards, Conway, Coulthard, Maloney, Bloomfield, Baker, Bailey, Robertson, H. Wilson, Barrass, Kinsella, McIntosh, O'Neil. Carlton Reserves played Carlton Zingari at Princes Oval. "The Carlton Zingari - which has only suffered a defeat once this season, met the Carlton 2nd. Twenty, on the Oval, last Saturday, and after a very exciting game, during which neither side had any perceptible advantage, the match ended in a draw each side obtaining 1 goal, Berry doing the needful for Zingari, and Slattery ditto for Carlton." Best and the only players mentioned; William Westwood, Walsh, Slattery, Donovan, and Spear. "At the meeting of the Carlton committee on Tuesday night, it was unanimously agreed in their match against Hotham, on the 12th. August, to hand over to the Hotham Cricket Club their share of the proceeds towards improving their ground for next football season." Carlton and South Melbourne were asked to donate the gate takings from the South Melbourne match next Saturday to the Victorian Rowing Association, both clubs refused. Melbourne and Essendon were willing to donate their gate takings. "A curious request was made to the South Melbourne and Carlton clubs by the Rowing Association to hand over to them, as a benefit, their share of today's takings. The request was not complied with. The curious portion of the request is in the fact that the Rowing Association deprives all persons earning their livelihood by manual labour from competing for any trophies in rowing, on the ground that they are professionals, and yet they quite willing to take the money of the "professionals" (both of them being chiefly composed of working men), and offer its trophies amongst themselves." Carlton played South Melbourne at the East Melbourne C.G. There was some discussion if the game should ahead or be cancelled. Despite the incessant rain a crowd of 6,000 attended, and the grandstands were packed. One correspondent suggested that football must be a fascinating game, or, there are a lot of lunatics in this city as 2,000-3,000 people were prepared to stand in the outer and get soaked to the skin. Just after the start, South Melbourne were fortunate to score their only goal. It was not long into the game before the ground was turned into a sea of mud, and the players were slipping and sliding. The Blues had opportunities to score, but the heavy, waterlogged and greasy ball, made kicking very difficult. With 5 minutes left in the game, Coulthard marked in front, 15 yards out, and scored the equaliser. Baker, Bailey, Barrass, Bloomfield, Bragge, Coulthard, Conway, Coventry, Frayne, Goer, B. Murphy, Maloney, McIntosh, O'Donnell, O'Neil, John Rickards, Robertson, Smith, F. Spear, Wilson. Players mentioned; (15) Rickards, Wilson, Goer, Maloney, Bailey, Coventry, Coulthard, Bloomfield, O'Neil, Frayne, Conway, Murphy, Butler, Barrass, Baker. Carlton Reserves played South Melbourne on the South Melbourne C. G.
Doran, Goding, Graham, Hassett, Leach, Longstaff, Melville, Muir, McKay, J. Rickards, G. Robertson, Spear, Slattery, Sutherland, Thornhill, Woods, Woodburn, Wilmott, Walsh, Westwood. Best; Walsh, Robertson, Woods, Rickards, Spear, and Muir. This was possibly the Dons' first victory over a Carlton senior team. Weather was fine, but the ground was soft due to the recent rain. Essendon won the toss and kicked with the wind to northern end. Rickards kicked off at 3.15pm. Essendon playing on their new home ground played a perfect game easily overwhelming the Blues. Coulthard missed a couple of easy chances to goal early on. Baker, Bailey, Bragge, Barrass, Bloomfield, Coulthard, Conway, Coventry, Frayne, Goer (Capt. ), B. Murphy, Maloney, McIntosh, O'Donnell, O'Neil, John Rickards, Robertson, Smith, Spear, Wilson. Emergency; James Rickards, J. Woods. Best; A. Wilson, Frayne, Maloney, O'Neil, Goer, Bailey. Players mentioned; (16) John Rickards, Frayne, Coventry, Goer, Smith, Spear, Wilson, O'Neil, Bloomfield, McIntosh, Coulthard, Maloney, B. Murphy, Bailey, Robertson, Barrass. Goals; Leach, Hassett, Woodburn, Slattery. Best; Muir, Walsh, Melville, Slattery, Goding. After investigation the charge against Bailey of Carlton for wilfully striking Cameron of South Melbourne in the face was dismissed. Changing ends after 30 minutes of play was once again brought up. "I see the question of changing ends more frequently was again considered, and with the result of things being allowed to remain in their present unsatisfactory condition, and I suppose we will now have to possess our souls in patience till the fog of an extreme conservatism be dispelled from the minds of a number of our worthy delegates, or till the place that knows them now shall know them no more, and others of more liberal views are to the fore." Weather fine, a brisk northerly breeze blowing goal to goal, and the ground was dry. Frayne was the Blues only absentee, replacement unknown. Rannard of Melbourne won the toss, kicked with the wind, and a desperate game developed. Baker, Bailey, Barrass, Bloomfield, Coulthard, Coventry, Conway, Frayne, Goer (Capt. ), B. Murphy, Maloney, McIntosh, O'Donnell, O'Neil, Rickards, Rickards, Robertson, Smith, F. Spear, Wilson. Best; Baker, H. Wilson)), G. Smith, O'Donnell, Bailey, Goer. Players mentioned; (17) Goer, James Rickards, John Rickards, Spear, Bloomfield, McIntosh, Coulthard, O'Neil, Wilson, Bailey, O'Donnell, G. Smith, Baker, Maloney, Coventry, Murphy, Barrass. The weather was mild, the ground was in good condition, and a crowd of 3,500 attended. Goer won the toss and chose to kick to the southern end. Play began at 3.30pm. Only 12 first twenty players took part in the game, and the Blues missed many opportunities to goal. Coulthard had two goals which were not given. Frayne, O'Donnell, Bailey, A. Wilson, and Coventry did not play. Baker, Bailey, Barrass, Bloomfield, Baker, Conway, Coulthard, Frayne, Goer, Maloney, McIntosh, O'Neil, John Rickards, James Rickards, Robertson, Smith, Spear, Walsh, Wilson, Woods. Carlton Reserves played Royal Park at Princes Oval.
.*In August the Ballarat club made arrangements to play the Sandhurst Association. The Ballarat secretary wrote to the Sandhurst Association enclosing the piece from the Sportsman newspaper regarding the height of the goal posts. and hoping that the problem would be rectified. "Such a stupid assertion as that contained in the Sportsman was quite in keeping with the ridiculous reports of the match which appeared in the other weekly papers. If the posts were rather short, it was only to the advantage of the Carlton team, as had they been higher, what was recorded as the first goal for Carlton would have been merely a behind, as the ball would have struck the post." Carlton played South Melbourne at the South Melbourne C.G. Weather fine and the ground was in good condition. Goer won the toss and kicked to the railway end. Coulthard who had a roving commission was dangerous and scored an early goal with a nice place kick. He shortly scored another goal, this time from 60 yards out. The Blues put on another two goals after the break to O'Donnell and Baker and led 4-2. South not to be out done, with a withering burst late in the game slammed on four unanswered goals. Baker, Bailey, Barrass, Bloomfield, Conway, Coulthard, Coventry, Goer (Capt. ), Murphy, Maloney, McIntosh, Tom Nosworthy, O'Neil, O'Donnell, Rickards, Rickards, Robertson, Smith, Spear, Wilson. Goals; Coulthard 2, O'Donnell, Baker. Best; Baker, A. Wilson, Coulthard, Coventry. Players mentioned; (17) Baker, Coulthard, O'Donnell, Wilson, Coventry, Goer, John Rickards, Barrass, Bloomfield, Murphy, Woodburn, Maloney, McIntosh, Smith, Spear, Robertson, Conway. The Herald Friday 04 said Carlton Second Twenty were to play Brighton at North Brighton. South Melbourne protested that Carlton had played Tom Nosworthy a Sandhurst player, without the permission of the V.F.A. on August 5. Crowd; Between 1,000 - 1,500. While this match was played on Essendon's home ground, Essendon played Melbourne on Carlton's Princes Oval. Proceeds go to the development of the Hotham Football and Cricket ground. A fight erupted not long after the start between A. Wilson and Ley of Hotham, then almost immediately after, Tankard and Couthard clashed. This was to be George Coulthard's 140th. and last game. The V.F.A. suspended Coulthard and Tankard (Hotham) for fighting. Hotham appealed and Tankard was later reinstated, but the V.F.A. refused to lift the ban on Coulthard, even though the Carlton champ had a clean record. Coulthard later contracted tuberculous and died painfully in October 1883. Hotham won the toss, and Robertson kicked off at 3.20pm. The scores were not a true indication of the game. However, the Blues did make the most of their chances. "Woodburn by a low quick kick scored the fourth goal, Bloomfield contributing a fifth. The ball was marked by Tankard, but the umpire (Mr. R. McInnis) ruled that it had gone past the posts." Bailey, Baker, Bloomfield, Conway, Coulthard, Coventry, Goer, Maloney, Murphy, McIntosh, Tom Nosworthy, O'Donnell, Rickards, Rickards, Robertson, Robertson, Smith, Spear, H. Wilson, Woods. Goals; McIntosh 2, Coulthard, Woodburn, Bloomfield. Best; Coulthard, Coventry, Rickards, Goer, Wilson. Players mentioned; (12) Baker, G. Robertson, McIntosh, Maloney, Coulthard, Coventry, Wilson, Woodburn, Bloomfield, Rickards, Goer, Nosworthy. "While the ball was being thrown in onto the eastern boundary Tankard (Hotham) and Coulthard (Carlton) came to blows, but were quickly separated. The crowd rushed the ground seeing the disturbance, and play was interrupted for some time"
"At the recent Carlton and Hotham match on the East Melbourne cricket ground, Tankard, in the heat of the moment, struck Coulthard in the face, and the latter retaliated in kind, further strife being at once stopped by their respective comrades." "Moreover, another part of the affair that strikes one with astonishment is, that they made distinction between aggressor and aggrieved. Now, there is a very manifest difference between the man who strikes a blow, however tempted. I think, in view of all things and especially of the fact of it's being the first offence, that a censure or short disqualification would have amply met the case, and in Coulthard's case, especially, it would have quite sufficient punishment, as he was first struck." "Shortly afterwards Coulthard and Tankard came to blows, and one of the most disgraceful affairs witnessed on a football field was enacted. The language used by one of the combatants was of a very low and filthy character. It is hoped that this matter will be brought under the notice of the Association, and in any case that body should take some action, otherwise respectable people will be obligied to absent themselves from football matches." August 12; "A disgraceful scene occurrred at the East Melbourne Cricket ground to-day during the football match Carlton against Hotham. A disagreement occurred between Couthard, of Carlton, and Tankard, of Hotham, ending in a stand-up fight, which was put to a stop by the crowd rushing the ground." The V.F.A. acted, and the following week matters reached boiling point. Carlton Reserves played Melbourne Imperial at the back of the E.M.C.G. The V.F.A. met, and decided to suspend Coulthard and Tankard for the remainder of the season. Read the Herald's report of the VFA meeting, The VFA agreed to disqualify both players for three matches. Carlton were to play Melbourne at the East Melbourne Cricket Ground. The Carlton committee would not take responsibility for playing Coulthard, and the Blues' players insisted on playing Coulthard, and defying the V.F.A. ruling. Both teams were on the ground. The Melbourne captain refused to play, except under protest. The match did not take place. Both the team and the committee regretted this action against Melbourne, their old foe and friend. Baker, Barrass, Bloomfield, Coulthard, Conway, Coventry, Goer, Murphy, Maloney, McIntosh, Tom Nosworthy, O'Donnell, Rickards, Rickards, Robertson, Robertson, Smith, Spear, A. Wilson, Woods. Carlton Second Twenty played Royal Park on Princes Oval. Carlton disagreed with the V.F.A. 's decision to disqualify Coulthard for the remainder of the season for disorderly conduct. The twenty players chosen refused to take the field unless Coulthard was permitted to play. The Carlton executive appeared to intend to secede from the V.F.A., but took no further action. "Such action as this is not worthy of a club with the reputation of the Carlton, and it's members should be the first to uphold the rulings of the Association." Carlton Reserves/Second Twenty played Royal Park on Princes Oval. Sir, The Carlton Football Club, feeling dissatisfied with the recent action of the Victorian Football Association re the Coulthard enquiry, are taking steps to receive sworn evidence in the matter, and I am desired on behalf of the club to ask the public in the meantime to withold their judgment. CARLTON FOOTBALL CLUB - Coulthard inquiry. Evidence solicited. Select committee MEET on Tuesday evening, 8 o'clock, Clyde Hotel, Carlton. "It is stated that the Carlton Club, which has been fined £10 for playing a man a second time who did not belong to the Club, intends to secede from the Association." The unregistered player mentioned would be Nosworthy. A letter to the editor of The Argus from the Hotham F. C.
E. J. Lawrence, Hotham Hon. Sec., pleading on behalf of Joey Tankard that he should be let off with a lighter sentence than George Coulthard, as the latter was found guilty of using bad language. A large meeting of Carlton members took place at the Clyde Hotel. These members were upset at the treatment handed out to Coulthard by the V.F.A. A "select committee" had been formed and by 9pm felt that they could not proceed any further. They took some evidence, in private, from one or two persons. It is understood that this will be added to at a further meeting. These details have not been released to the press. The Argus gives it's opinion on the Coulthard-Tankard affair in it's editorial. "Football as played in Melbourne, appears to be degenerating from a fine manly game into an exhibition of unseemly brawling and brute force. The public reserves and cricket grounds are occupied Saturday after Saturday by excited crowds and still more excited players. The latter quarrel violently amongst themselves, and many of them use the most offensive language, while the contagion of the passion spreads to the crowd, which howls and roars in it's excitement, and too frequently emulates the players in the use of bad language. The whole scene is one of noise, turmoil, and uproar, more in keeping with a street row than with the pursuit of a legitimate sport.The nuisance has been growing worse and worse, and the brawling culminated on Saturday week in a disgraceful scene on the East Melbourne ground. In the midst of play, during a match between Hotham and Carlton; blows were exchanged between TANKARD, of Hotham, and COULTHARD, of Carlton; and the latter aggravated his offence by using language of a most improper kind, not once, but repeatedly. The matter was brought under the notice of the Football Association, which promptly disqualified both players for the remainder of the season, expressing the opinion at the same time, that COULTHARD was more to blame than the Hotham player. We do not think the Assocation could have done less, and it might have been expected and that the decision would be acquiesced in and repected. But instead of that, we find the Carlton Club defying the Association and insisting on playing COULTHARD the very next Saturday in a match against Melbourne. The Melbourne team very properly refused to allow a proscribed player to take part in the game, and the match fell through. We trust that footballers generally will show no sympathy with the Carlton Club, but will make common cause in upholding the authority of the Association. If football is to be a reputable game - if it is to be saved from the ruffianism which is fast corrupting it - such conduct as COULTHARD'S must be severely repressed. The Assocation, in the course that it has taken, has had the interests of the game and the reputation of the players alike at heart, and though it has roused itself to vigorous action rather late in the day, it ought to be thanked and applauded by footballers, as it assuredly is by the public. The game must be played decently and respectably, or it will become a question whether it should be permitted at all in places of general resort." For an amusing (?) take on FOOTBALLERS BEHAVING BADLY in 1882. V.F.A. special meeting held at Young and Jackson's Hotel, Swanston Street. "A letter was read from G. Coulthard one of the Carlton players asking that the nature of a charge made against him at the preceeding meeting of the association might be clearly explained, and further that the association would favour him with their written decision on the occasion of having disqualified him for disorderly conduct in the field. The secretary was instructed to provide the information required." Others matters were on the night's agenda. "At the completion of the meeting Mr. T. P. Power, one of the Carlton delegates, and Mr. H. H. Budd, representing Benalla, tendered their resignations as hon. treasurer and secretary respectively. After expressing regret at the action taken, the association requested both gentlemen to reconsider the matter, and hold office at least until the close of the present season." "The Executive of the Carlton Club, however, who, it appears (says The Argus), intend to secede from the Association, refused to take any action which would render them liable to further punishment pending their withdrawal, and as their players still remained obdurate, the teams (who were in uniform, ready to start) left the field, and an announcement was made that the match would not be played. It is not known whether the Carlton Club intend to throw up their other engagements for the season, or whether their players will consent to take the field against other clubs without Coulthard's assistance." Carlton were to play Geelong at the East Melbourne C.G. Carlton, because of the Coulthard situation also cancelled this match and Geelong played Hotham instead. A mixed Carlton Firsts and Reserves played Britannia at Princes Oval. CARLTON FOOTBALL CLUB - Coulthard inquiry,- Select committee MEET to receive evidence This evening, 8 o'clock, Young and Jacksons Hotel, Swanston street. The Carlton Football Club backed down in defying the V.F.A. The club decided to meet the rest of it's engagements without George Coulthard. They were due to play East Melbourne, but this will now be changed to playing the Melbourne F. C.
The Sportsman newspaper congratulated Carlton, but says they should have taken this step earlier. The paper commends those clubs which had refused to play the Blues while they were in revolt. The Carlton Football Club see on reflection that a mistake had been made in ignoring the decision of the association disqualifying Coulthard, owing to the fracas which occurred between that player and Tankard, and they have decided to complete the season without him. At the same time they do not admit that their crack was in the wrong, and have, in fact, absolved him from blame. A mixed team (seniors/reserves/others) from the Carlton F. C. played the junior team, Melbourne Imperial Trades. Goer, Bloomfield, Conway, Conway, Barrass, Tom Nosworthy, Woods, Spear, Spear, Hall, William Westwood, Snodgrass, Keefe, "Bluey" Flowers, Tulley. A. Wilson was from the Star of Carlton. Carlton had numerous shots at goal which resulted in behinds. Rain stopped the game 20 minutes before time, with the Imperial team victorious. Best; Goer, Bloomfield, Tully, Conway, Spear. V.F.A. Meeting at Young and Jackson's Hotel, Swanston street. Carlton delegate T. P. Power resigned at the last meeting and Mr. T. J. Marshall would take his place. The Hotham Football Club wrote and requested that the season ending disqualification against Tankard be overturned as from September 2nd. Mr. H. H. Budd from Benalla, and Mr. B. Hall, Geelong, asked the association to refuse the request. The request was put to a vote and passed 9-4. A letter was then read from the Carlton Football Club that a similar concession be made to their player George Coulthard. Carlton delegated Mr. Marshall said that in Coulthard's eleven year career no charge of a similar kind had been brought against him. This was put to the vote, and rejected 7-6. Carlton also had to pay a £15 ($30) fine for playing Tom Nosworthy, a former Sandhurst player, without obtaining permission from the Association. Nosworthy's application for a permit was rufused, even though he had moved to live near Melbourne. The V.F.A. decided that in future no permits will be issued after July 25. VALE - EAST MELBOURNE F. C.
The Australasian reports that the East Melbourne Football Club has disbanded. The members did not want the club demoted to junior status. The players have been playing each week against adversity and feel that if they had had their own ground, then the Oriental's fate may have been different. The players can't play with another club this season, however, most will probably join the Melbourne club next year. Carlton played Melbourne at the Melbourne Football Ground. The ground is still in it's primitive condition of roughness. Melbourne was due to play East Melbourne, but their demise opened a spot to play the Blues. One report said it was the largest crowd of the season. The Australasian said at least 10,000. The day was fine, and Carlton kicked with aid of a slight wind in the first half. Frayne and Maloney did not play. Baker, Bailey, Barrass, Bloomfield, Conway, Coventry, Goer (Capt. ), Murphy, McIntosh, O'Neil, O'Donnell, Rickards, Rickards, J. Robertson, Robertson, Smith, Spear, A. Wilson, Woods, Woodburn. Umpire; H. C. A. Harrison. Before half time, J. Robertson and Sloman (Melb) clashed, both taken from field and took no further part in the game. J. Robertson was badly cut and required stiches to his face. Goals; Baker, James Rickards, Coventry. Best; A. Wilson, Goer, Coventry, Baker, Bloomfield, Woods, O'Neil. Players mentioned; (16) Bloomfield, Murphy, Baker, Bailey, O'Neil, James Rickards, Goer, J. Robertson, John Rickards, Conway, Wilson, McIntosh, Barrass, Coventry, Woodburn, Woods. A meeting of George Coulthard's friends was held at the Clyde Hotel to consider the proposal of presenting him with a testamonial. The business was referred to a committee, which will be formed during the week. A few pounds have already been collected, which will probably be considerably increased. A fine, dry day with a slight breeze. The turf was a little heavy due to recent rains. Essendon were 2-1 favourites to win. Carlton were weakened with the loss of Coulthard (suspended), Frayne, and Maloney. F. Spear and J. Robertson were also unavailable. To everyone's surprise the Blues kicking, little marking, and pace was superior to the Don's in the first half. Half of Essendon's behinds were rushed by the Blues. Baker, Bailey, Barrass, Bloomfield, Coventry, Conway, Goer (Capt. ), Murphy, J. Muir, McIntosh, O'Neil, O'Donnell, Jas. Rickards, Rickards, Spear, Spear, Smith, Wilson, Woods, Walsh. Goals; Jas. Rickards, A. Wilson, Bailey. Best; Conway, A. Wilson, Baker, Barrass. Players mentioned; (12) Bloomfield, McIntosh, Conway, Barrass, Wilson, John Rickards, Baker, Bailey, O'Neil, Coventry, Murphy, Woods. Moves are afoot next year to promote the Richmond club to the senior ranks and a Fitzroy club maybe established next year. The Australasian reveals the voting results the V.F.A. went through to uphold the decision to suspended George Coulthard. For; Budd, Boyd, Swift, Hall, Major, Gilchrist, and Wynne. Against; Harrison, Longden, Jordan, Lawrence, Hearne, and Marshall. 5/7ths. of the majority were delegates of country clubs, Horsham, Ballarat, Geelong, Benalla etc; while the minority were all entirely metropolitan clubs. "The conclusion of the whole matter points very plainly to a reconstruction of the association, now apparently little better than a smaller circle into which are brought the various jealousies and petty personal interests of individual clubs, with a smattering of rival cricket concerns thrown in, and the substitution of a representative body, elected by the whole of the clubs, who would have the general interests of the game at heart, and not see it through the medium of club spectacles, or as the means of keeping their club's turfs during the unprofitable summer months." A special train left Spencer Street at 1.10pm for Geelong. A player named Brownlow named in Geelong team. Goer won the toss and kicked to the Southern goal aided by a strong wind. Walsh's goal from a mark, was a 60 yard drop kick. Baker, Bailey, Bloomfield, Barrass, Conway, Coventry, Goer, McIntosh, Murphy, Maloney, O'Donnell, O'Neil, Rickards, Rickards, Smith, Spear, Woods, Walsh, Woodburn, Wilson. Best; Baker, Bailey, Maloney, Conway, Bloomfield, H. A. Wilson, Henry. The ground was in good condition, however a gusty northerly wind was blowing across the ground which marred the spectacle. Carlton kicked to the eastern goal, however South Yarra soon had the first goal on the board. Barass in the second half got things off to a good start with a splendid run and kick. Bailey, Baker, Barrass, Bloomfield, Conway, Coventry, Goer (Capt. ), Murphy, Maloney, McIntosh, O'Neil, O'Donnell, Rickards, John Rickards, F. Spear, J. Spear, Smith Wilson, Woods, Walsh. Players mentioned; (13) Bailey, Barass, Murphy, McIntosh, Wilson, John Rickards, J. Spear, Goer, F. Spear, Baker, Smith, Bloomfield, Maloney. Donations collected for the Working Men's College. The ground was in good condition and the grass had recently been trimmed by a flock of sheep. Play commenced at 4pm. Melbourne kicked with a strong north west wind to the Cemetery end in the first half, which the Blues used to full advantage in the second half. Baker, Bailey, Barrass, Bloomfield, Conway, Coventry, Goer (Capt. ), Murphy, Maloney, McIntosh, O'Donnell, O'Neil, R. Rickards, Jas. Rickards, Smith, G. (F?) Spear, J. Spear, Wilson, Woods, Walsh. Goals; Bailey 2, O'Donnell, Goer, J. Spear, G (F?). Spear. Best; Bailey, Conway, Maloney, O'Donnell, J. Spear, G. (F?) Spear. Carlton Football Club Handicap 100, 200, 300 yards for First and Second Twenties, to be decided by points. First in each events 5 points; second, 3 points, and third, 2 points. The winner in each event to receive 1 Pound. First Prize; 4 Pounds and Gold Medal, Second Prize; 2 Pounds, Third Prize; 1 Pound. Medals presented by Mr. Kennedy. First Prize; Trophy presented by J. Gardiner, Second; 1 Pound, Third; 10 Shillings. 1. J. McWilliams, 2. J. Spear, 3. Muir. Prize winners to kick off for Mr. V. Robertson's Trophy. To be decided by points; First, 5 points, Second 3 points, Third 2 points. The winner in each event to receive 1 pound. Total Points; First, J. Baker (11 points), Second, A. Coventry (10 points), Third, Rickards (7 points). "At the Carlton Football Club Sports on Saturday, the prize for a drop kick was won by Rickards with 63 yards." "On paper, from first to last this season, Carlton has had about the strongest team on the arena, but lack of generalship has undoubtedly in large measure contributed to the second rate results achieved by the club. Whether the experienced gained will bring about an improved condition of affairs remains to be seen, but it is highly improbable that the club's rightful position will ever be reasserted under existing circumstances; moreover, the difficulty can be solved without going outside of the club's own ranks. The first match against Geelong was a very good proof that the old club is not dead yet, and only wants a little improved discipline to regain it's former prestige." It's leading players have been H. Wilson, Bloomfield, Frayne, Baker, Maloney, Coulthard, Conway, Bailey, Goer, F. Spear, Barrass, Smith, O'Neill, McIntosh, O'Donnell, and Coventry. Major goal kickers; Coulthard 14, Baker 11, Bailey 8, John Rickards 6. The Carlton Story. Hugh Buggy and Harry Bell. Pages. 51, 52, 53, 259. Everything You Wanted To Know About Australian Rules Football But Couldn't Be Bothered Asking. Graeme Atkinson. Page 100. The Carlton Advertiser and Trades Advocate. The South Australian Register, 1882 editions. The Launceston Examiner, 1882 editions. The Gippsland Times, 1882 editions. The Australian Town & Country Journal (N.S.W. ), 1882 editions. The Horsham Times, 1882 editions. Contributors to this page: blueycarlton , Bombasheldon , molsey , nikki and admin . Page last modified on Friday 12 of April, 2019 08:21:17 AEST by blueycarlton. 1987 Rd 13 - Buckley's now a chance for finals action. 1986 Rd 17 - Peter Dean.